Bernice F. Pruitt, 92, of DeSoto, TX passed away on August 3, 2014. She was born March 8, 1922 in McKeesport, PA the daughter of Daniel Norman Lewis and Mae Elizabeth (Clifford) Lewis. Bernice entered the Women's Army Corp August 16, 1943 from Pittsburgh, PA and served until 1945. Later, she began working at IBM, where she remained employed until retirement. In 1968 she marreied L. C. Pruitt in Chicago. She was preceded in death by her husband in July 2013. Mrs. Pruitt is survived by her step-son: L.C. "Lennie" Pruitt, Jr.; sisters-in-law Bettye J. Wilson and Clara Pruitt; many nieces and nephews; a host of cousins and friends and her very close friends Erma Johnson, Lora Stallings and Rose Johnson. The family will receive friends at the funeral home prior to the funeral service on Friday - August 08, 2014 from 9 - 10:00 A.M. The Funeral Service will begin in the Chapel of West/Hurtt Funeral Home at 10:00 A.M. with Rev. M. T. Flemmings, officiating. Interment will follow at 12:30 P.M. in the Dallas/Ft. Worth National Cemetery, Dallas, TX. All on the SAME DAY. It was Mrs. Pruitt's wishes, in lieu of flowers, memorials be made in her name to The Salvation Army, P.O. Box 36006, Dallas, TX 75235-1006. 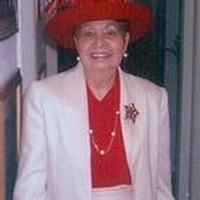 Elizabeth Ann (Lewis) Armour, age 95, of Battle Creek, MI, passed away on Sunday, January 5, 2014 surrounded by her friends and “family” of the Laurels of Bedford in Battle Creek, MI. She was born September 27, 1918 in Scotthaven, PA the daughter of Daniel Norman Lewis and Mae Elizabeth (Clifford) Lewis. 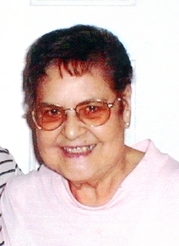 Elizabeth had worked as a secretary and social worker for the State of Illinois for many years until she retired. After she retired she became bored and worked for 10 years at a Gentlemen's Club in the Chicagoland area as a coat check lady (the reason she worked there for 10 years is because they promised her a small pension). Elizabeth had married Ninas Duey Armour in Chicago, IL on March 22, 1976; however he preceded her in death on March 12, 2010. She and her husband came to live in Battle Creek from Chicago, IL in 1985. She is survived by her sister: Bernice Florence Pruitt of DeSoto, TX; a nephew: Lennie Pruitt of Chicago, Illinois; two guardians: Lorri L. Heddinger of Battle Creek and Cynthia Woodin of Tekonsha, MI; and many devoted staff and residents at the Laurels of Bedford. Elizabeth was preceded in death by her parents; a daughter who passed away at birth; five sisters: Gloria Johnson; Margaret Liser; Bernice Smith; Esther Lewis; Dorothy Kalkbrenner; and two brothers: Clifford Lewis and James Lewis. She was a member of St. Philip Catholic Church while living in Chicago and had attended St. Philip Catholic Church in Battle Creek. She had always made it a practice to attend 8 AM Mass while living in Chicago and also when she lived here in Battle Creek. Visitation will be held at the Bachman Hebble Funeral Service on Thursday, January 9, 2014 from 4:00 PM - 7:00 PM, with the Rosary service at 7:00 PM in the funeral home chapel. Funeral services will be held in the Bachman Funeral Chapel on Friday, January 10, 2014 at 10:30 AM with The Very Rev. Father Mark Vyverman of St. Joseph Catholic Church officiating. Burial will follow at the Memorial Park Cemetery in Battle Creek, MI. A fantastic time was had by all at the 2014 San Diego Reunion! 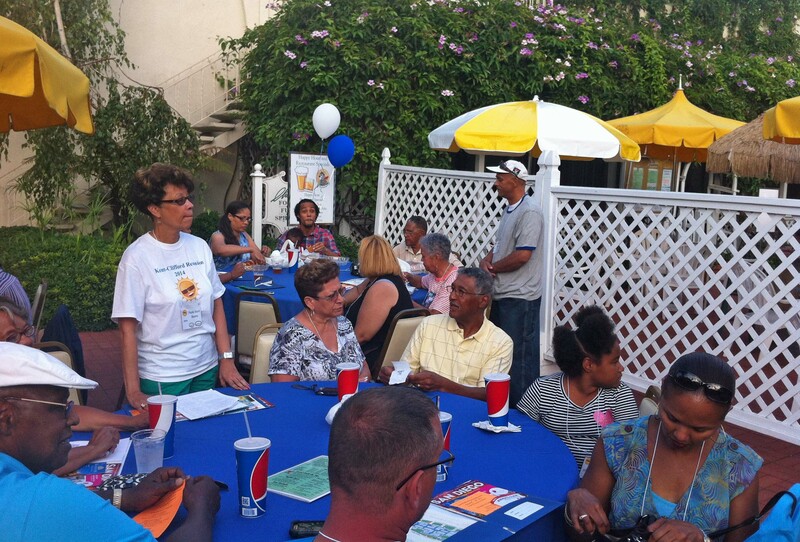 Our Friday evening meet and greet was on the patio of a cafe at the resort. Everyone seemed to enjoy the food, drink, and games. The young assistants to our gracius hostess were wonderful at getting family members to buy raffle tickets for some pretty great prizes! Everyine stayed pretty late playing pool, video games, or just sitting outside enjoying the weather and company. The duties of the Immediate Past President were added. "Upon completion of the two year term of office the out-going President shall remain a non-voting member of the Executive Board and serve as an advisor to the Executive Board until the next election is held." Additional duties for the Chaplain include "preside over the Memorial Service and provide spiritual leadership at the REUNION." Additional duties for the Historian include "The Historian shall coordinate and supervise historical exhibits and displays at the REUNION and collect names of family decedents for the Memorial Service." A new position of Webmaster was added and the duties include "The Webmaster shall maintain a Website to serve as a centralized location to collect and display family and REUNION information." A sentence was added to the Dues and Fees article for clarification of the payment of dues. It reads "Dues shall be paid annually by the membership by July 1 of each year." So we had fun and got a lot done! Now let's start planning for Moorefield!